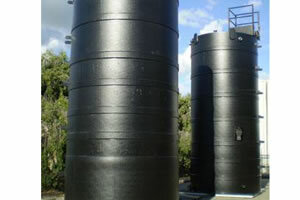 Fabricated tanks are made from sheets of material, such as HDPE, which are welded together using specialized equipment to form the tank barrel, base and roof. Rotationally moulded or “Roto” moulded tanks are formed via the use of a thin steel or cast aluminium mould. Powder is placed in the mould, which is then rotated and heated so as to make the powder distribute around the inside of the mould. After that, the mould is cooled and split apart so that the moulded part can be removed. Generally, there are four important areas where chemical vessels fabricated from extruded HDPE differ from roto-moulded vessels manufactured from LLDPE, LDPE or LMDPE. It’s possible to estimate the serving life of a fabricated tank while impossible for a roto-moulded tank. All plastics that are subject to stress will age with time. This requires that vessels holding dangerous chemicals are manufactured from materials whose aging behaviour has been accurately determined from long-term testing. At present, we already get critical information such as creep strength and long-term elastic modulus of high density polyethylene and polypropylene via long-term (+30 years) pipe pressure tests. The testing results (referred to in DVS 2205 and BSEN 12573) allow engineers to design a fabricated tank of a known working life with confidence. In comparison, there is no such long-term test data available for the roto-resins used in the manufacture of roto-moulded tanks. Engineers have no access to critical information such as creep strength, long-term elastic modulus and allowable hoop stresses of the resins. As a result, it is impossible to design a roto-moulded vessel with expectable working life, since the basic behaviour of the material with time has not accurately been found out. Made from different materials, fabricated tanks and roto-moulded tanks show different mechanical properties. The major difference between the high density polyethylene used for fabricated vessels, and the polyethylene used for Roto-moulding, lies in the length of the ethylene molecules which make up each kind of material. HDPE has a molecular weight of over 300,000. For polyethylene utilized in the roto-moulding process, typically MWPE or LLDPE, have a molecular weight ranging from 50,000 to 100,000. It means that the HDPE molecules are up to three times longer! This extra length allows the HDPE molecules to create more ‘knots and eyes’ between them, increasing the toughness, creep resistance, and stress cracking resistance. What’s more, HDPE retains an optimum level of crystalinity, which contributes to a high tensile strength and stiffness. Due to material difference, fabricated tanks have better ESCR resistance than roto-moulded tanks. Over time, corrosive chemicals attack at the micro-cracks in any polymer surface. Several factors influence the stress cracking resistance of the polymer. However, results from independent tests have already shown that HDPE resins have far superior ESCR resistance compared to those resins used for roto-moulding. In addition, when we want to measure ESCR for pipe grade HDPE and materials of roto-moulded tanks, we are required to employ different standards, which also reflects the difference of ESCR properties between the two materials. The standard for pipe grade HDPE resins for fabricated tanks requires that a specimen be immersed in surfactant at a temperature of 80 ℃ to sustain a full load of 4MPa for 100 hours. For pipe grade HDPE resins the requirement is for a specimen immersed in surfactant at a temperature of 80 ℃ to sustain a full load of 4MPa for 100 hours. For roto-moulded resins, the temperature requirement is 60 ℃ and the duration requirement is only 20 hours. The different requirements reflect the difference in capabilities of the materials. There are internationally accepted pre-eminent design codes for fabricated thermoplastic chemical vessels, namely DVS2205 (a German guideline available in English) and the BS EN12573. They provide detailed design procedures considering long-term hoop stress, wind-loading, nozzles, manholes, temperature effects up to 60deg, and stress concentration factors. As a result, fabricated tanks can be manufactured under reliable guidance, which allows for high quality products. Compared to the fabricated thermoplastic chemical vessels, there is just a preliminary design standard for roto-moulded tanks, the AS/NZS (Int.) 4766, which only provides one calculation for the hoop stress. The temperature limitation of operation for the vessels is 24 ℃. The standards do not support design to a known life because, as stated before, there isn’t reliable experimental data to support it. On the whole, fabricated tanks offer superior performance and longer serving time, in comparison with the roto-moulded tanks.